A single finger bone found in Saudi Arabia dated to 85,000 years has been definitively identified as human, and is changing the paradigm of human migration out of Africa. 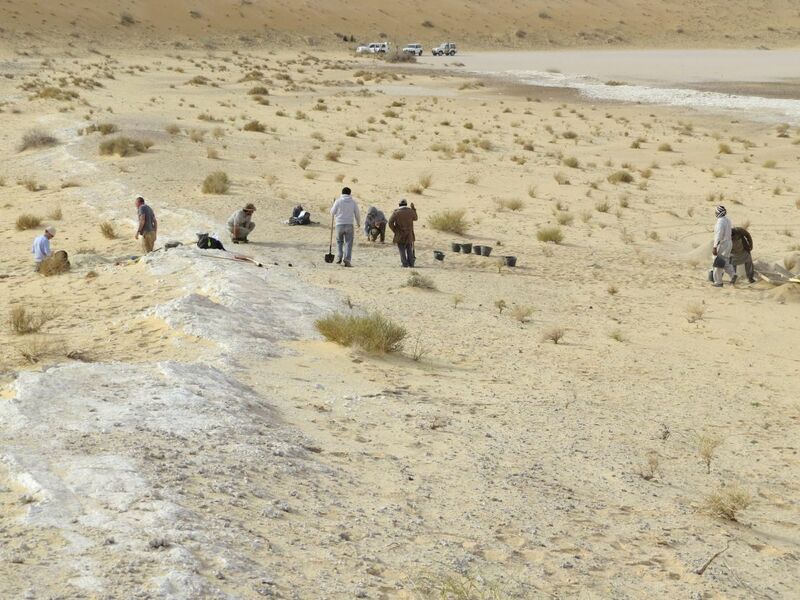 The unexpected discovery at Al Wusta – today a site in the heart of the Al-Nefud desert – shows that modern humans left Africa much earlier than had been thought, in multiple waves. Also, the location of the fossil far from the sea indicates that the model of humans hugging the coasts while leaving Africa is wrong, too, according to the report in Nature on Monday. If anything, the bone in and of itself understates the potential revelation regarding our prehistory. It was found in 2016 by Dr. Iyad Zalmout, a paleontologist with the Saudi Geological Survey. Until recently, the consensus theory had been that Homo sapiens left Africa in some mass migration around 60,000 years ago. Then evidence began to accrue that humans had begun to trickle out of the continent much earlier, in small groups of hunter-gatherers. 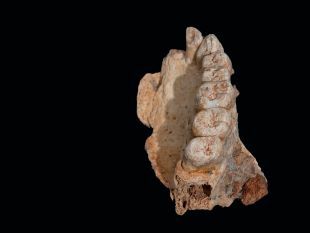 Archaeologically, the earliest-known remains of Homo sapiens outside of Africa is a jawbone discovered in northern Israel, in a cave called Misliya, which also dates to around 200,000 years ago. The Misliya evidence indicates Homo sapiens began migrating out of Africa about 190,000 years ago, Petraglia says. Some scientists have been less than bowled over by the Misliya Cave discovery, arguing that, geographically, Israel is part of Africa. But definitely nowhere near Africa were the teeth found in a cave in southern China, which showed Homo sapiens had reached there 100,000 years ago. Human fossils from Laos were dated to between 70,000 and 46,000 years ago. Recent studies have claimed the aboriginal population of Australia may have reached there as long as 65,000 years ago. And now comes the Saudi evidence of human existence not in Africa, nowhere near a coast, and way earlier than expected. Other fossil evidence elsewhere in the Levant shows more migrations between 130,000 years ago to 90,000 years ago, he says. Barring successful analysis of preserved DNA, identifying a species from ancient bone is difficult. Not all agree the case is closed that the almost-200,000-year-old jawbone fragment (with several teeth) found in Misliya Cave is human, for instance. However, proponents of the theory argue that it groups most closely with Homo sapiens. Can this one single tiny fossil, the intermediate phalanx from a finger, tell us whose it was? Yes, says Petraglia. Neanderthals were ruled out because the finger would have been too gracile for that beefier species, he explains. Intriguingly to laypeople, this finger bit was identified as human with the help of comparison to remains found in Israel, Egypt, medieval Canterbury, and Maiden Castle in Dorset. Some anomalies in the bone’s cross-section were explained by postulated stress from intense physical activity, which may be partly explained by their efforts to adapt. Today, the Al-Nefud is forbidding desert. Not then. Though reconstructing paleoclimate and relating it to behavioral change in humans is tricky, based in part on extrapolation of the Earth’s positioning vis-à-vis the sun, scientists believe that when these early people reached the Arabian Peninsula, Nefud (or Nafud) was semi-arid, not dry as a bone. Periodically, the rain on the peninsula plain would be more plentiful, enhanced by seasonal monsoons. Also, clearly, there were permanent freshwater lakes. 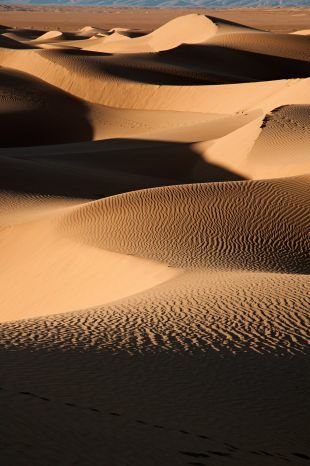 The Sahara, today the biggest desert in the world, had once been green too. 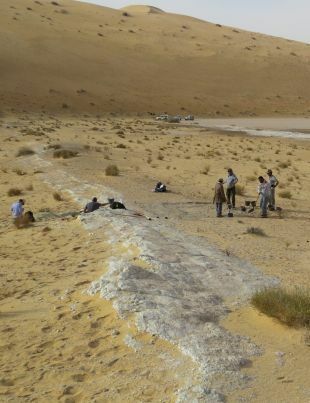 The team postulates that modern humans seeped into Arabia repeatedly, during wet episodes, when lakes, rivers and grasslands were present. They would have followed the animals also moving into the region, Petraglia notes. The archaeologists also found 380 stone tools, mostly made of chert sediment rock and quartzite. 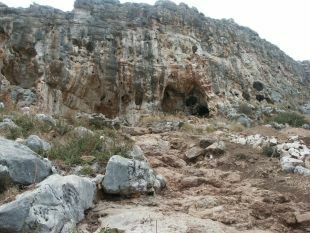 The tools were similar to later finds in Arabia, and contemporaneous assemblages in the Levant, including at the cave in Qafzeh, in Israel’s Lower Galilee. Apropos of which, the various finds in Israel, and now Arabia, cannot help resolve the burning question of whether anatomically modern people were trickling out of Africa, here and there, or whether there was much longer occupation of Arabia and Asia than is thought. In any case, early Homo sapiens didn’t just seep out of Africa to the rainy Levant, but reached deep into the semi-arid Arabian interior. It speaks to the adaptability of humankind. 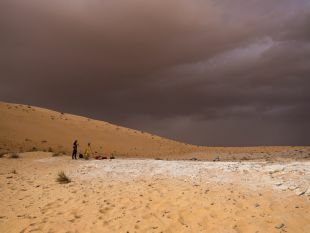 The adaptation may not have been brutal: The Saharan environments whence these early modern men originated were probably very similar to the Arabian environments, he says. But all things come to an end.